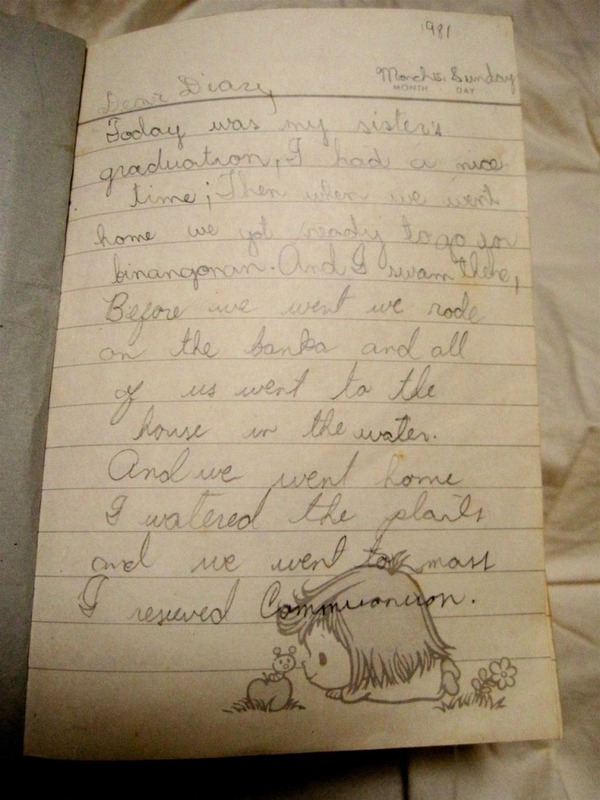 This was my first ever diary entry – in the first diary I ever owned. It was began while we still lived in the Philippines. I won't reveal my age by admitting how old I was when I wrote this (in pencil, no less). But suffice it to say, I was young. I hated writing with a pen back then because I couldn't erase anything whenever I made mistakes. During my recent trip to Brooklyn, it was unearthed from deep in storage. I have not cracked open the pages of this in YEARS. It made me laugh to see what I wrote back then and remember things I had long forgotten about. It's quite humbling and moving, too. I am so glad I saved this. I had to document and share. Today was my sister's graduation, I had a nice time; Then we went home and we got ready to go for binangonan. And I swam there, Before we went we rode on the banka (a small boat with outriggers) and all of us went to the house in the water. And we went home I watered the plants and we went to mass I resieved Communion. It was my birthday and we went to Taal lake and we swam there we had a long trip and we brough baby Christine the water was blue, we saw some fisher men catch some fish, and mama and my lola (grandmother) went near the net and they saw a snake in the water one man threw the snake far away. and we ate, and went home after that.